I was on Tybee this morning with all the kids (plus the moms and younger siblings) for the last "Hurrah" before school starts. I saw your red jeep parked at Lazarreto Creek and the kayakers half-way to the lighthouse. :o) All the kids that were in your camp went CRAZY knowing it was you or Nigel our there....!!! We had a great trip yesterday. Lots of dolphins in Lazaretto and a big ol' gator cruising the mud flats around the lighthouse. Next summer the Sea Sprouts will visit the Lighthouse for a local history excursion. The old geezers ruled this week at SC&K with the '60 and Up' posse throwing down the gauntlet and showing the rest of us what retirement really means...not very much ! Rick D came down from Atlanta for some rough water training, and for two days, with 15 knot winds we zigged and zagged across the Tybee Triangle. I was constantly impressed by Ricks sustained energy levels as well as his boat handling skills. Among others things, we worked on functional stability and rolling in surf. Then Kent showed up with his big ol' HV and a desire to maintain the level of self dependability he's become accustomed to all these years. " 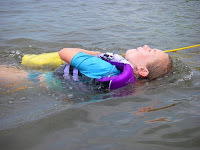 If I'm going to go off kayaking, I need to be able to roll, right ?" . You said it Kent. Thank-You very much gentlemen... It was a pleasure to assist in your continued quest's in this world. .. Saturday Aug 8th @ 6pm. 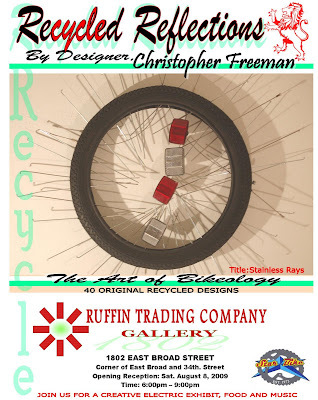 A Cool exhibit for a hot summer..! Hope you can join us.. Please pass on the info..
By Jimmy Ha. in Utah. 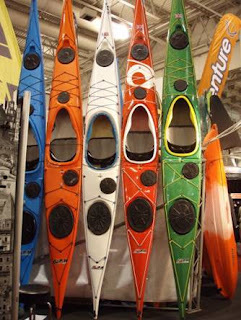 Another Outdoor Retailer show is now behind us – with lots of new energy and models to drive paddle sports into 2010. It was obvious that the timing was “off” for the show – as several manufacturers and dealers didn’t attend. However, with much heated discussion over the last 2 years and concern over timing of the OR show – it certainly sounds like the show will be moved into August. Canoe & Kayak’s alternative show in Minneapolis in September would be the alternative. Even with timing off, there were still plenty of dealers and manufacturers to keep us all busy. The demo day was “insane” as the beach had been eliminated - and a bottle neck of kayak and Stand up boards crowded the boat ramp. I’ve never seen so many SUP’s in my life – and certainly seems that they are here to stay (for a while?). Venture gives the Easkys a new Face Lift by offering the “deck pod” as standard equipment on the 13, 15 and 15 LV. 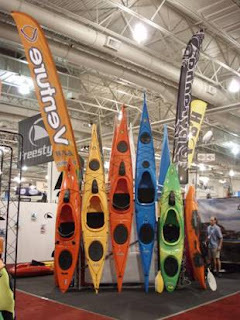 P&H continued to establish the range as a leader in Sea Kayaks – both plastic and composite. New Pricing on stock Glass Capellas got the attention of all – as did the new sporty 15’. As always, the custom colors and quality plastic models got the attention of all. Kicked off this weekend in Santa Cruz, Portugal. The event is taking place over the next ten days in a combined beach festival that includes Kite Boarding, Body Boarding, Surfing and Skim Boarding. The beach festival site includes a swimming pool where you can cool off, try out kayaks or play with your kids, 3 stages pumping out live music through out the entire festival, and several restaurants. The opening fireworks began at 1 in the morning. Those Europeans sure know how to throw down a beach party. The US East Coast team got off to a good start yesterday with five members advancing to the next round. Heats are 15 minutes long with four paddlers competing , during which time they get judged on wave selection, length of ride and style. New East coast team member Tom May ( Grand Masters HP) has been consistently winning heats with high scores but alas, Spencer Cooke today was eliminated from his IC heat. The Team event does not start until next week. Other paddlers of note looking likely to taking the big trophy are Edu Exteberria - consistently paddling hard and fast with lots of flair - Chris Hobson, a very competitive and extreme surfer- and Corin King, another Northern Irish lad really ripping it in the competition atmosphere. And of course Chris Harvey- 3 time winner of Santa Cruz- and very hungry for that first world title. Conditions so far have been small swell, windy and choppy, with a gnarly dumping beach break if you get too close to the shore. Come Monday things are expected to ramp up with an 8ft swell predicted and the beginning of the Open HP heats...yummy !. Luke Learns 'Un-Islamic Mullah Omar' Roll. Luke is a soldier in the Third Infantry Division. 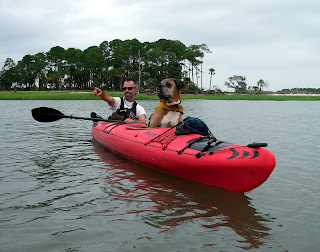 After coming out with SC&K on a couple of trips earlier this year, Luke decided kayaking was for him. He bought a kayak from us last month and paddles every chance he gets. Rolling was high on his list of skills to nail and he did so in short time. After about an hour Luke was righting himself with a strong torso rotational sweep roll. Of course, all the rolls we caught on video were the 'ugly ones', but the lessons learnt are good. Luke has a couple of months to practice before shipping out to Afghanistan were he will not only be disliked for being a kayaker, but also for being an American. Despite some excellent paddling locations in the country, kayaking was banned by the Taliban in '96. We wish Luke all the best and hope he gets to torture the Taliban with some skillful paddling displays and is instrumental in re introducing paddlesports to the Afghan people. A little more sweep and god willing.. ! Nice job Luke. Now go sock it to Mullah Omar ! 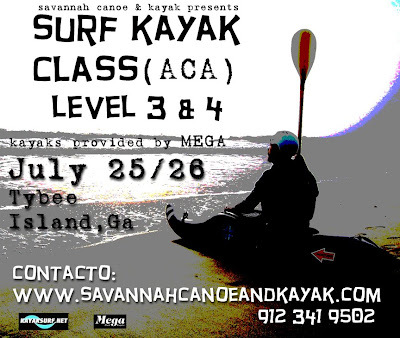 It's not the world championships, but it is surf kayaking. Seven Supermarkets in Britain got together with a plan to reduce the numbers of plastic shopping bags being given out. And after only one year, 346 million fewer plastic bags per month were being used. The British Retail Consortium believes consumer behaviour has now changed, helped by supermarkets giving out free re-usable bags and awarding loyalty points to customers who bring their own bags. Environmentalists say plastic bags take hundreds of years to decompose despite typically being used only once. Discarded bags blight the landscape and kill small animals and birds that become snared up in them. Plastic bags also make it into the sea, where they are eaten by turtles and marine mammals, who mistake them for jellyfish. To the Supermarkets....Asda, Co-Op, Marks & Spencer, Sainsbury's, Somerfield, Tesco and Waitrose... we salute you. 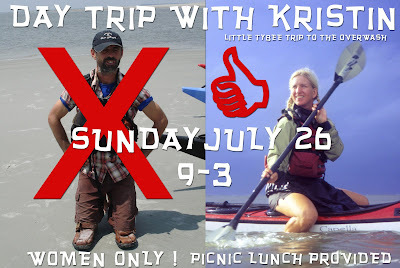 Sunday morning paddle throught the marshes of Little Tybee and down to the overwash. A swim , a chat and a picnic lunch before departing back. Home by three ! $95. includes lunch and all gear. Sea Sprouts Slides from Julie. 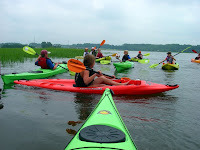 Our July session of Kids Kayak Kamp earlier this week was a huge success! With two mums and eight sprouts in a variety of kayaks, we crammed about four days of programming into two camp sessions...the pace was non-stop frenetic fun. 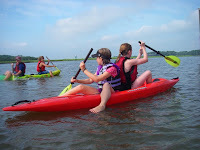 Of course, all the games and kayaks are just a vehicle for lessons that are far more important than kayaking, and those lessons come thick and fast with kids, boats, and water. Aside from the most obvious aspect of water safety, we are also nurturing self confidence, team work, and personal character building. 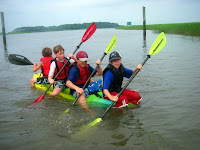 As a by product the kids learn how to kayak, and have an absolute blast doing so! It's a win win situation. Top game was Muddy Buddy followed by Noodle Jousting. We also practiced paddle levitation techniques, floating meditation, and of course our favorite, 'How to Save your Best Friend'. Big thanks to Julie M for rounding up the Sea Sprouts! 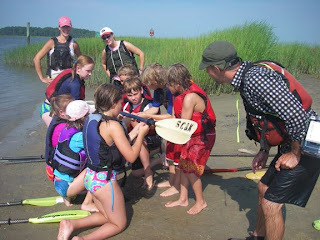 Next Sea Spouts Kids Kayak Kamp session: August 10-11, 2009. Spaces available. Captain Nigel and first mate, VJ, are also available to hire for birthday parties, demos, and youth organizations. 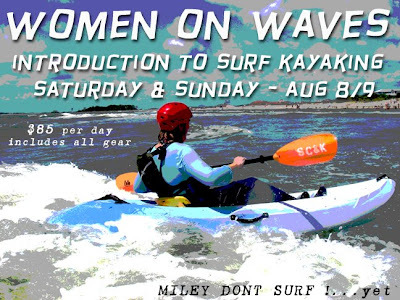 For all mothers and daughters, aunts and sisters, let's go surfing ! Warm waters, friendly surf and a great holiday destination ...what more can we ask for. SC&K ...helping you make the most of a great place to live. "I've spent many years thinking through the design of the Xcite, from the early years of shaping the Romany, through the Rockpool phase and now into the third and most refined evolution. The Xcite has been my toy, a boat shaped so I may paddle the way I wish to paddle. The Xcite paddles best for me when I forget that the boat is there, I have a notion in my head of where I want to go and what I want to do, and I just get on and do it, the boat should not interfere with the paddling process. This is my idea of an 'advanced boat', its not about the conditions or the size of the water, its about being allowed to perform the way you want to perform. The Xcite is a fast boat down a wave, its made for moving water and steep short waves, Anglesey style. It's a boat that will take me some time to learn, but that's the best fun for me. The harder I push it, the more I learn. It rewards a bit of boldness on the part of the paddler, especially in edging and commitment. " Better surfing....the art of the top turn. Video feedback. 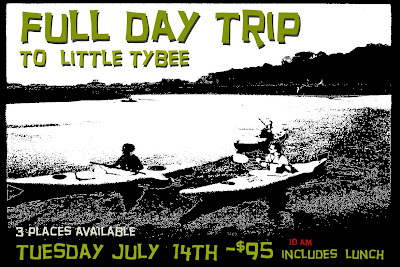 Full day trip through the marshes of Littler Tybee. Beautiful scenery with lunch on an empty beach ! As well as the scheduled trips and classes, SC&K is a custom guiding service. So, if you want to let rip in the best surf, study the shore birds in detail or are just looking for the best scenery for your next oil painting drop us a line and we will get you to the best places on the coast. A private picnic on wilderness beach...no problem. Location hunting for that next ad campaign...no problem. Custom surfing trip to the islands by canoe...no problem. Pool rolling demo at your party...no problem. Slide show presentation about paddling 3000 miles...no problem. Kayak stunt double for Miley Cyrus (blond version)...no problem. If it's within our bio-regional area and has anything remotely to do with paddle sports ...we can help. The masses descended upon the islands in full force for this Independence weekend, with record numbers attending the very awesome Tybee Fireworks Friday evening. At the request of Tybee beautification society, residence were out in force Saturday morning to quickly whisk away the cans, bottles and other debris that was left by the patriotic litter louts. An astonishing ten tons of trash are discarded on Tybee beaches on a holiday weekend. 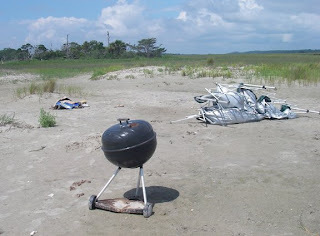 Little Tybee too, did not escape the littering fervor that comes with the 4th... fireworks, bottles, cans and fag butts abound on LT.
"it's a testament to our freedom that we can throw our trash were-ever the hell we please." said a large dude with a sun burnt neck. We will be conducting a beach sweep on Bucks Beach tomorrow, Monday at 9am. If you want to come and help we will rent you a kayak for free. If you're looking for a way to show your patriotism this Independence Day, please join the Tybee Beautification Sunrise Beach Sweep on July 4th and help the Department of Public Works clean our beautiful beaches. The litter is usually overwhelming after the fireworks and your help is needed to "sweep" up the mess. Volunteers should meet at the pavilion at 6:30 am for supplies. In addition to bags and gloves, water and light refreshments will be provided. If you have any questions, please contact Kathryn Williams at 786-5258.